iTunes now is not only a tool play music and manage libraries, but also extended to be video players. Besides downloading and purchasing movies and musics from iTunes store, you can also import movies and musics from your individual folder on computer to iTunes. Have you ever encountered difficulties in transferring movies and musics to iTunes ? In this post, we will show you how to import movies and musics from computer to iTunes. 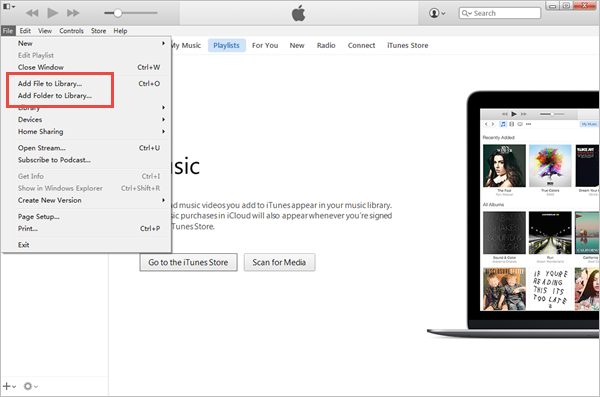 You can directly import videos and musics to iTunes if the video and music formats are supported by iTunes. Video: Up to 1080p, 60 fps, High Profile level 4.2 Coding, 768 kbits/sec, 320 x 240, 30 frames per second (fps), Baseline Profile up to Level 1.3. Audio: AAC-LC Up to 160 kbits/sec, 48 Khz and stereo audio. Video: Up to 2.5 Mbps, 640 x 480, 480 x 480, 30 fps, Simple Profile Coding. Audio: AAC-LC up to 160 kbits/sec, 48kHz, stereo audio. Video: Up to 35 Mbps, 1280 x 720, 30 fps. Audio: Ulaw, PCM and stereo audio. 1. Download and launch the latest version of iTunes, click “File” menu from the navigation bar and select “Add File to Library” or “Add Folder to Library”. 2. Just click “Open” to add videos and musics to iTunes. Some users find it difficult to transfer movies and musics to iTunes if the formats of which are not supported by iTunes, as they always found nothing when they click “Add File to Library” or “Add Folder to Library”, no matter how many times they try. So what they are required to do is to convert video and music formats to files supported by iTunes. Below are 2 methods to convert videos and music formats. Jihosoft Video Converter is a powerful tool which supports video conversion between all popular SD/HD videos and audio formats. 1. Download the free trial version of this software, launch it and click “Import” to load videos to this program. 2. 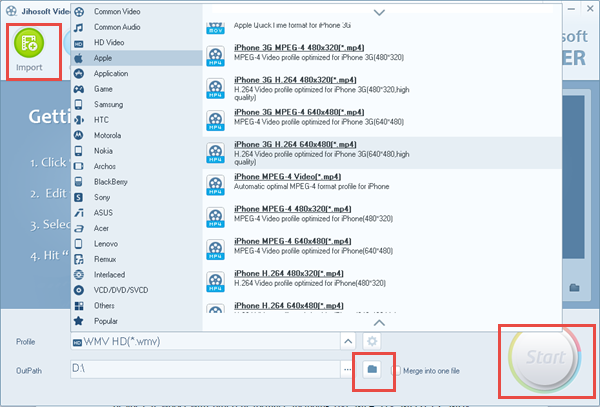 Select the video formats that iTunes support from the drop-down menu of “Profile” and Click the folder icon to select the output path that you want to save the converted videos. Note: Besides video formats, you can also convert video to audio formats or extract audio from video with this software. 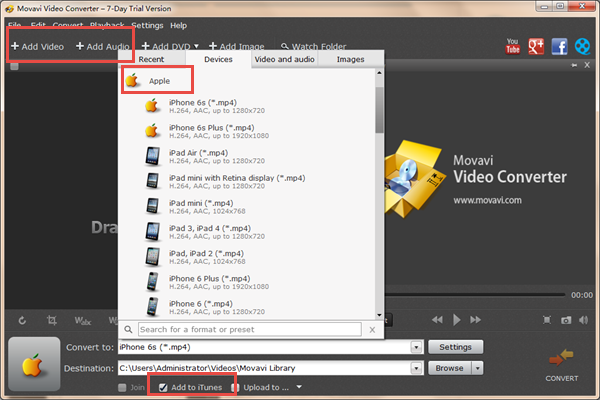 With Movavi Video Converter, you can rapidly transfer movies and musics to iTunes. Besides, it works with different formats, including AVI, MP4, FLV, MPEG-1,2, MOV, MKV, WMV, VOB, 3GP, SWF, MP3, AAC, WAV, etc. 1. Download the free version of this program and complete the installation according to the instructions. 2. Click “Add Video” or “Add Audio” button in the upper-left corner and select musics or videos that you would like to transfer to iTunes. 3. Open the convert list, 200+devices will be listed as below, choose a device from the Apple list to play the videos or musics, then click “Setting”. 4. In the destination field, select a folder to save output files and simply click “Add to iTunes” to import videos and musics to iTunes.